ROXAS CITY, Capiz, Jan. 10 (PIA6) -- Day-long activities marked the first year anniversary of the Special Weapons and Tactics (SWAT) team of the Roxas City Police Station (RCPS) last Jan. 9 here. RCPS director Supt. Kashmir Disomangcop said that a firing competition among SWAT team members at the Sibaguan Firing Range here and a boodle fight lunch highlighted the anniversary. Roxas City Mayor Angel Alan Celino and councilor Powell del Rosario graced the activities. Disomangcop added that during the anniversary celebration, Celino has directed him to coordinate with the Police Regional Office (PRO) – 6 and PNP national headquarters in Camp Crame for a training of some of the SWAT team members on bomb disposal. The need for a training on bomb disposal is an offshoot of the recovery of an improvised explosive device last December at Barangay Lawaan, here. “We also want to establish motorized crime operatives to augment police visibility and counter riding in tandem criminals,” Disomangcop noted. 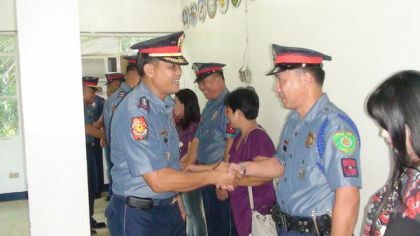 Considered to be the fully-trained and equipped elite group of the PNP in Western Visayas, the team was created in January 9, 2011 which paved the way for the 45-day SWAT Basic Training Course that ended in a graduation rites last March 8 at the Governor’s Hall of the Provincial Capitol here.